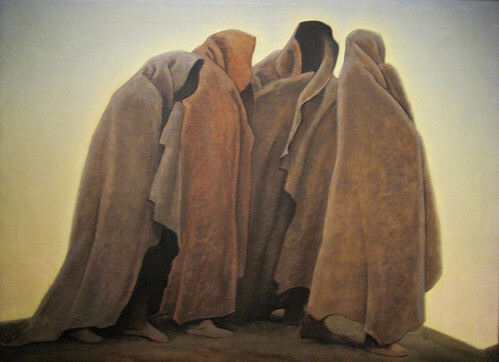 I love this painting by Maynard Dixon for the way the abstract idea of fear is concretized here,in the way the four shapes representing four humans stand huddled together ,their faces missing but their feet visible under their long cloaks. The cloaks appear like shrouds hiding faces paralyzed by fear . Out of the four shapes only one is facing the viewer ,with a mere hole of a face where the face is supposed to be. The rest of the four may not be having any faces here or may not have had any at any time. Fear makes one so much faceless in the face of danger. The feet are apparent and visible because in a “fight or flight ” situation, feet are essential,even when the faces are lost.